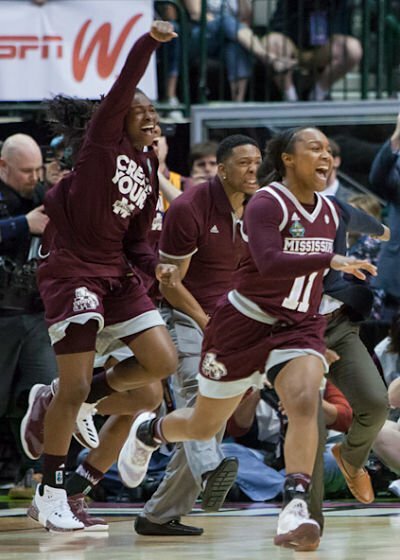 Mississippi State players exult after the final buzzer sounds. Photo by Robert L. Franklin. 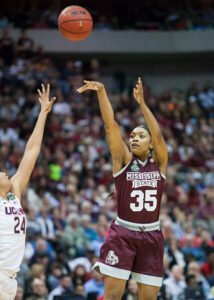 Dallas – For the second time in five days, the smallest player on the court saved the game for Mississippi State. 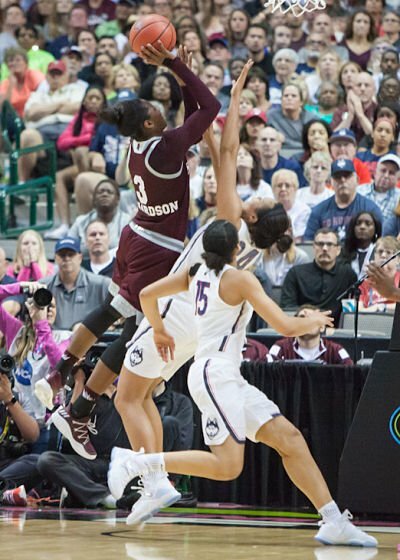 But this time, Morgan William also helped the Bulldogs snap Connecticut’s 111-game winning streak and advance to the National Championship game with a 66-64 ovftime win. 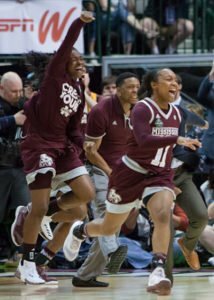 The junior point guard, whom coach Vic Schaefer said is likely shorter than her listed 5-5, scored a career-high 41 points in Sunday’s Elite 8 unseating of Baylor, which sent the Bulldogs to their first Final Four. Friday against the formidable Huskies, William and her team controlled the pace of the game from tip off, disrupting the rhythm of the defending champions and matching them bucket for bucket and rebound for rebound. William scored 13 points, but it was her last two that were the most critical. Morgan Tuck drives by Kia Nurse. Photo by Robert L. Franklin. 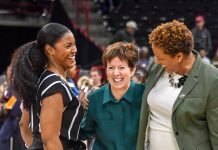 UConn had tied the game with 26.6 seconds left in overtime with a pair of Katie Lou Samuelson free throws from a flagrant foul call on Dominique Dillingham. 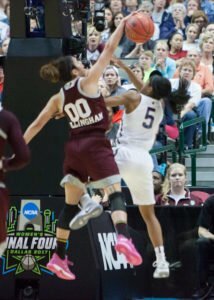 The Huskies retained possession, but Saniya Chong’s rushed shot with 12.3 seconds remaining gave the ball back to Mississippi State. Schaefer called a timeout, and told William in the huddle that she was about to win the game. William’s shot at the end of regulation was blocked by UConn’s Gabby Williams, but at the end of the game, William got a pass from Dillingham and dribbled to the right side of the key. 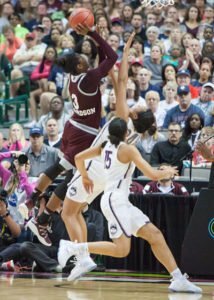 She threw the ball up, which dropped cleanly through the next as the buzzer sounded, sending the majority pro-Bulldog crowd into a frenzy. Victoria Vivians launches two of her 19 points on the night. Photo by Robert L. Franklin. William seemed just as surprised as anyone else, as her teammates mobbed her on court. “When I made the shot, I was in shock. I’m still in shock. I’m over here like, Hey, I just won the game,” William said. Victoria Vivians led Mississippi State with 19 points, while Breanna Richardson had 12 and Teaira McCowan 10. Gabby Williams led four Huskies in double figures, with 21 points. UConn was seeking a fifth consecutive title in a year that was supposed to be “rebuilding” after the graduation of Breanna Stewart, Morgan Tuck and Moriah Jefferson. 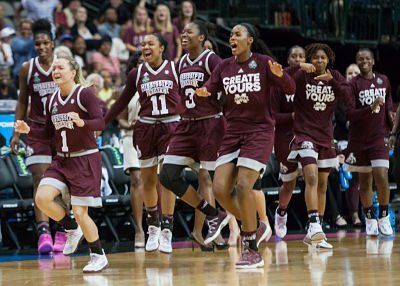 The Bulldogs were looking for redemption after losing to the Huskies by 60 points in last year’s NCAA Tournament. 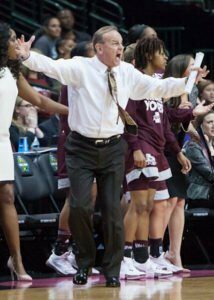 The loss motivated Schaefer to guide his team through a tough preconference schedule this season that had them on the road for all but two games, crossing the country. They broke a school record for best season start and were undefeated until a loss to South Carolina Jan. 23. 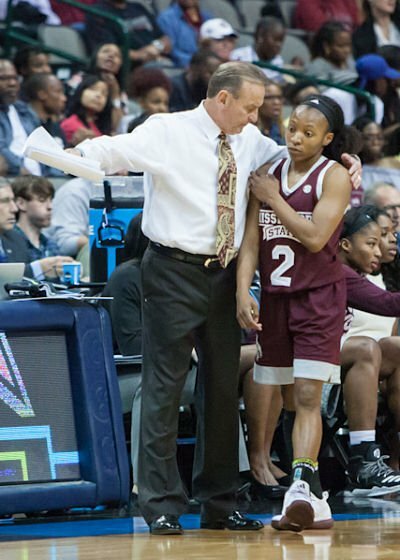 Vic Schaefer calls out instructions in the fourth quarter. Photo by Robert L. Franklin. The challenging game slate proved to be the perfect preparation for the ultimate revenge on UConn, which hadn’t lost since 2014. Mississippi State had been so strong throughout the NCAA Tournament that Schaefer said he didn’t know when he realized they could topple the Huskies. UConn coach Geno Auriemma said Mississippi State’s pressure proved to be the undoing for his young team. Breanna Richardson scores over Napheesa Collier. Photo by Robert L. Franklin. The Huskies were down after each of the first two quarters – a position they haven’t found themselves in much lately. Unlike their Championship opponents South Carolina, the Bulldogs have no high school or collegiate All-Americans on their roster. Schaefer said he looks for athletes to fit his program, whether or not they’ve won awards. 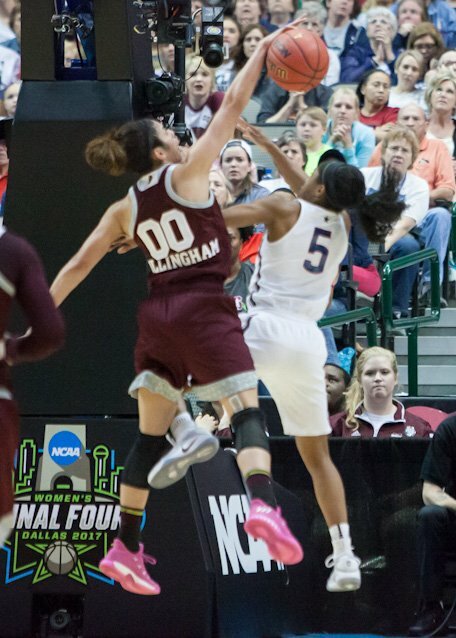 Dominique Dillingham blocks Crystal Dangerfield’s shot. Photo by Robert L. Franklin. 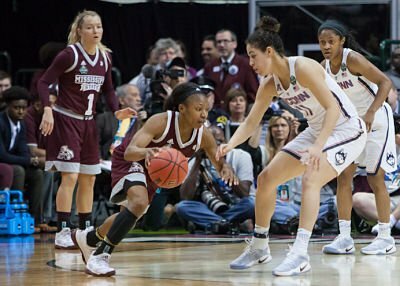 Mississippi State and South Carolina, which beat Stanford in the other Final Four match up, know each other well from Southeastern Conference play. The Gamecocks swept the season series, and Sunday’s match up will pit the two physical teams with similar playing styles against each other for the proverbial third time – South Carolina, without center Alaina Coates. Schaefer said his team will be ready. Vic Schaefer has a moment with Morgan William. Photo by Robert L. Franklin. The National Championship will be 5 p.m. CT April 2 on ESPN. Bulldog players celebrate their Final Four semifinal win. Photo by Robert L. Franklin.